one of my favorite clerks at work is retiring and you know what that means - I needed a card for her. That flamingo from Your Next Stamp is my favorite for that. I just love his expression. I used the colors and ind of the sketch from YNS current challenge to get me started. Used an embossing folder as background and colored with water brush pens. Added some sequins. Deine Arbeitskollegin wird sicherlich sehr erfreut sein über dieses tolle Kärtchen. Der Flamingo sieht schon heftig unternehmungslustig aus - ob sie oder er das ebenso sieht??? Dein Blog hat ja wieder ein neues Outfit bekommen: sieht gut aus. 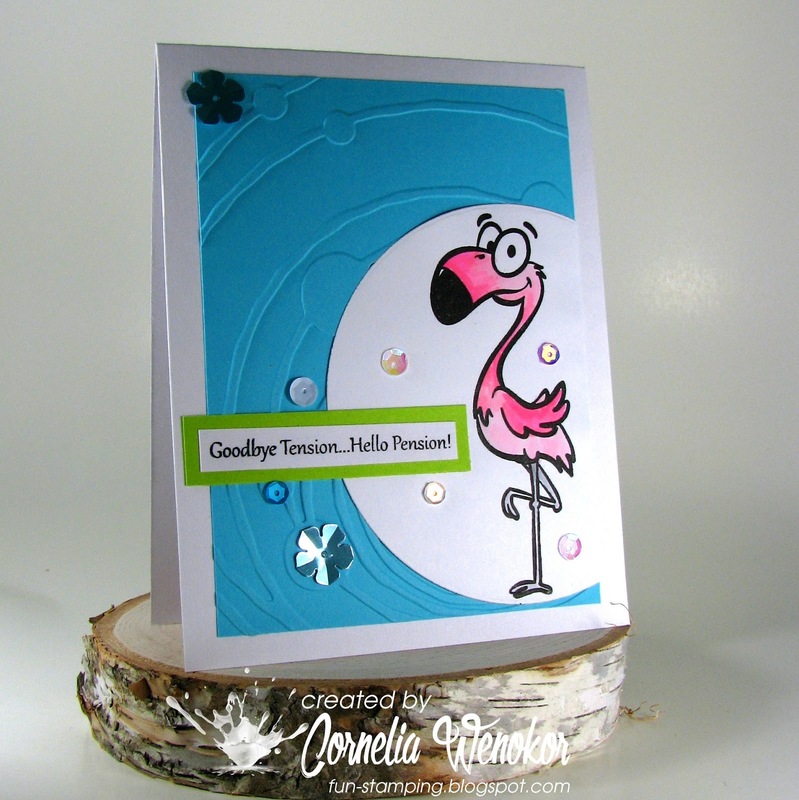 This is just too darn cute...what a fun and sweet retirement card. Love that flamingo! Happy New Year! This is so cute!! I love the embossed background and that image is adorable!! Great card. Don't know how you continue to come up with these splendiferous cards. Just another example of your design genius and sense of humor. This flamingo looks like he/she can't wait to leave that job behind. So cute and funny. A darling card and so well designed and colored too. I am sure your friend will love it.